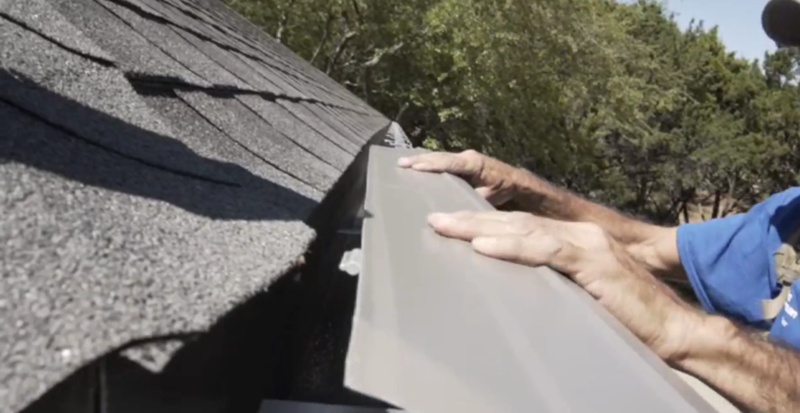 One of the biggest and most important purchases you can make to add value to your home is the perfect set of gutters. And unfortunately, many people don’t give this purchase the consideration it deserves. Research has shown that drainage products can put upwards of 150 holes in your home’s roof, rafters and gutters. These holes can lead to weakening in your rain gutter system or even gutter failure. So, when making such an important purchase, why would you leave it to chance that you might end up with a flawed gutter system? That’s why Austin Gutterman does gutters differently and does them better. That’s why we use LeafLock leaf guard gutters. Since the roof and the gutter are not penetrated by holes, the LeafLock leaf guard gutters can flow independently, thereby creating a permanent watertight seal that eliminates the possibility of wood rot caused by extraneous holes put in your house or gutter damage caused by unnecessary holes drilled into your gutters. Think about it… no holes, no rust! And with no damage done creating and installing your gutter system, we’re certain it will last for the life of your home! Let’s not forget the damage that can be done to your home by simply drilling holes into the roof and façade to anchor your gutter system. Over time, these holes can enlarge and become susceptible to wood rot. That means it can endanger your gutter system with a weakened support system and ruin the beauty of your home by creating unnecessary holes and unnecessary damage. Avoid these issues and choose a LeafLock leaf guard gutters from the experts at Austin Gutterman. We would be happy to speak with you about installing the perfect addition to your home. An addition, like the LeafLock leaf guard gutters, will add to your home’s value and protect your investment with the newest generation in gutter technology. Schedule a proposal online at www.austingutterman.com or call us today at 512-450-1821.